Think of a lightning that connects to the ground. If we are exposed to a chock or something that is overwhelming, adrenaline is released quickly and automatically a portion of energy in the body, so that we can fight or escape. If you have not had the opportunity to respond to the event, then that amount of energy can be locked in the body - you've got a trauma. This energy causes imbalance in the nervous system and can lead to various symptoms. Fortunately, you can free up the energy by unloading and regulating the nervous system. If you do, you call it self-regulation. One of the ways you can do it, is based on the water tank model. One uses a water tank as a picture of the body. The water symbolizes the energy. The ambivalent / nervous and disorganized attatched has difficulty controlling the autonomic nervous system itself. So if you have any of these types of attatchmentstyles, it will be a great investment for you to train and use these "water tanks" activities. IT can help the ambivalent to stop overthinking ect At the same time, it will be hard for you to get flow in these exercises. Your nervous system typically needs a person who can already regulate himself. One with a more secure attachment or possibly a trauma therapist. When you know how to do it, you can parctise everyday. WATER TANK MODEL: If you fill more and more water in a water tank and it has no drainage, the pressure in the tank will rise and it may be close to bursting. What do you do? Well, you can drill holes in the water tank. In these holes you put water hoses to water out and water pressure may fall. Same with our body: When there is too much trauma energy in the body, the pressure / excitement rises. The water hoses can be compared to our arms and legs. This way, energy that is bound to the symptoms can leave the body. Then the pressure / tension decreases and the symptoms ease. In addition, the energy gets a larger space to distribute itself and the pressure / excitement becomes smaller. However, the water hoses may be blogged, so that the water is difficult to drain. Then clean the water hoses, so that the water can flow freely. Similarly, in the body can be found blockages in our arms and legs that prevent the free flow of energy. Typical blocking sites are in joints (especially knee). It is therefore beneficial to move your joints quietly to loosen them and thus loosen the blockages. Rarely, energy can be blocked, where the nerve protrudes from the arms and legs. That is, in the upper part of the back (arms) or at the lower back (legs). If you are having trouble feel the feelings in your arms and / or legs after you have loosened the joints - then the blockage presumably where the nerve originates from the spine. Another way to get the energy flowing freely is by touch. The hardest part by this, is to remember to use it in the situation! The activity helped tsunami victims in India in 2004 to regulate their nervous system and get healed symptoms again after just an hour's SE trauma session including touch (there were no resources for multiple sessions). As there was acute trauma, the healing was obviously, clearer, faster and easier than if you have trauma of older date. Though you have no trauma, it will be a good activity to gain more ownership of the body and to to cope with more pressure and stress in your everyday life! A locked survival energy in the body produces imbalance. As life naturally gives some knubs, the imbalance can gradually be so great that you develop symptoms. Like a pendulum that gets too much speed and can not settle by itself. It gives much relief and an easier life when you get the frozen energy solved. 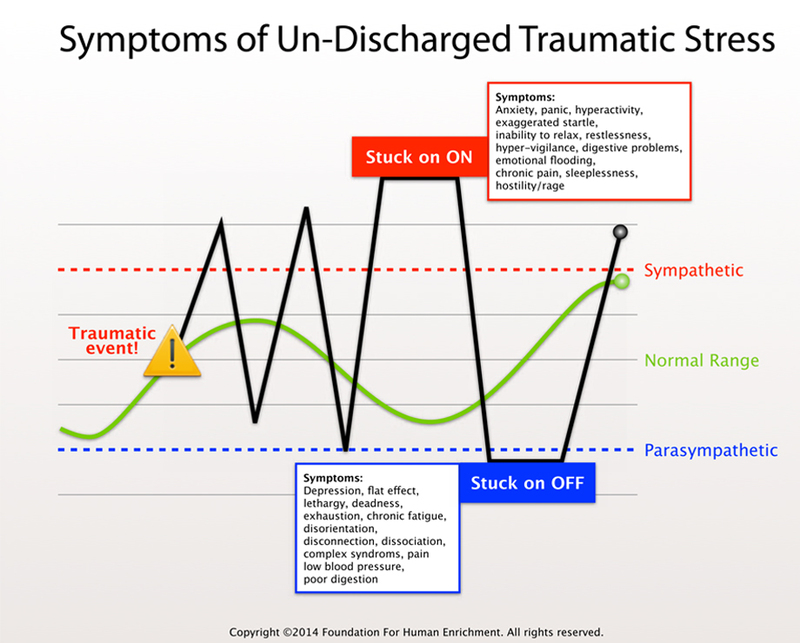 Sometimes you need the help of an (SE) trauma therapist before the energy can be landed properly. Sit on a hard chair, breathe in and out 3 times. Feel the chair supporting you, feel your seat knots, thies, legs and feet. If you cant feel your seat knots, move your hips from side to side. Move your feet, toes. If you can not feel your feet, move your toes and feet. You can lift your leg and puch your leg out one by one (like a child being born on the way out of the birth canal). Sence the sensations. Feel your seat knots, legs and feet. Can you feel the rest of your body? It is okay if you can not feel the rest of your body. Rest your arms on your thies. Feel your arms your underarm and the upper arm. Then feel your hands. If you can not feel your hands, move your fingers. Look at your hand palms and move your fingers. Let the energy/sensations move down through your arms and legs. Notice your body - the shift in your body and in your breathing. If you can´t get the enegy moving, your joints can be blocked. Look at the decription below, on how to release the blocks. You do not have to close your eyes. You only need that, if you find it hard to feel something. If you are used to meditate and / or feel the body, it is best that you have your eyes open and have 70% of your attention to the body. Then, the body can do a lot better work, because you do not disturb it (by trying to control the energy and the body). You can read the instructions as you do the activity. or feel something specific or analyze what you feel or why. · Has it been easier to feel your feet and legs? You do not have to close your eyes. You only need that if you find it hard to feel something. If you are used to To meditate and / or feel the body, it's best that you have open eyes and only use approx. 70% off your attention to the body. You can read the instructions as you do the activity. Brand still means that you send your attention to the given area, and just curiously register as objectively as possible what you sense. Do not try to relax or feel something specific or analyze what you feel or why. · Has it been easier to feel them? · You can move your hands a bit more - look at them too! Sit on a hard chair, feel the chair supporting you, feel your seat knots, legs and feet. Move your feet, toes. Rest your arms on your thies. Feel your arms and hands. Look at your hand palms and move your fingers. Let the energy/sensations move down through your arms and legs. Notice the shift in your body and when your breathing gets more relaxed. Just accept the different sensations in your body. Accept the feeling that comes up. How does it feel to be you right now. You can use the exercise if you can feel that you are going to cry. Also you can use it to stop overthinking, stress ect. I've learned to place one hand on my heart and the other on my belly, then letting the energy flow while reading a fantasy novel as a teen. The main character healed himself this way and I also found it to be calming. It is incredibly simple and effective, especially if you use it daily. It can eventually make you master in feeling your body. In addition, it can help you land your autonomic nervous system if you get activated (the nervous system becomes high stressed): When you are used to making this breath, it will often balance you back and give you peace. Start doing the exercise for 2-5 minutes, for example, just before you fall asleep in the evening. Or when you come home from work. Or before you start work in the morning. Later you can use it for a longer time 10-20-30 minutes. This is an effective way to get into the precent! It can also train your sensuality, and it's so valuable in your love life! · Use "looking gently" in your everyday life! · What do you notice right now inside you? tongue. How are you biting? How does it taste? · Stitch your nose in everything around you and smell. What does it smell like? soft, hard, hot, cold, clumsy, sticky etc. · How does it feel on different parts of the body: the hands, lips and perhaps other areas of your body? saliva production: the stomach moves and increases secretions for digestion. Use your body, do exercise, jogging ect. NB! It is NOT recommended to lie down in this state, because you will have a tendencie to regrediate and get flooded with negative thoughts and emotions. It´s the encaputulated child/encaptulated part of yourself that can get activated in this position. On exhalation, imagine that the light flows out of SolarPlexsus and over to the other (the one that is negative, angry, etc.). Touch is a basic human need. When we come into the world we are supossed to be touched, given kind and caring eye contact and beeing met with a soft tone of voice from our parents. In SE therapy/trauma and attatchment therapy, they often use touch in a way to get the client feel supported and getting the nerveus system to regulate back into secure state. This is another way to get the energy flowing freely. The hardest part by this, is to remember to use it in the situation! The activity helped tsunami victims in India in 2004 to regulate their nervous system and get healed symptoms again after just an hour's SE trauma session including touch (there were no resources for multiple sessions). As there was acute trauma, the healing was obviously, clearer, faster and easier than if you have trauma of older date. Though you have no trauma, it will be a good activity to gain more ownership of the body and to to cope with more pressure and stress in your everyday life! Sit on a chair, feel your seat knots, legs and feet. Be precent - experience how it feels to be touched right in this moment..
Let the other person move slovely and soft. You can tell, when the other person can move their foot or hand again. Let the bodypart tell, not the head. Some people do not like to be touched (often the desorganized). Then let the other persons hand/foot be 5 cm or so above the bodypart, that you want to be touched. Tell your partner, where you want to be touched. You can tell, when the other person can move their foot again. NB! The body will tell, not the head!!!! On the top of one of your feet - slovely and soft. On one of your knees. Take in the nurturing contact of beeing touched. Feel the sensations in your body and the shift in your body and the shift in your breathing. Sit on a chair and register with your senses. What do you hear? What do you sence? What do you see? But do not analyze or evaluate - just describe them objectively inside your head. Next step: Imagine being in the center of the world. That you are here and the world is around you. Allow the feelings you have to be there, but no more than that. Recognize them, but do not let them overturn you. 1. The human nervous system responds to touch. Hands-on healing has been used by humanity since ancient times. This could have to do with electrical currents, or the fact that we are calmed and held in specific ways as babies. 2. This is one of many exercises that forces one to focus on the body, this change of attention and awareness is therapeutic. See also exercise Felt Sense. 3. This is training one to be gentle towards self rather than harsh. This helps to build up this kind of relationship to self – a relationship that is characterized by being gentle, caring, kind and nurturing. Sometimes trauma seems to erase the sense of having a Self and where that Self might be in space and time. Doing either of the above exercises and giving the exercise a chance to sink in, in other words opening the body to allow the body to receive the exercise, can bring back a feeling of Self. This might occur first by having a feeling of having a location in space, being solid and being in one location. There may be a sinking into the internal awareness that “I have edges” which in turn helps bring an awareness that “I am here” (location in the world) and “I am me”(ego-identity). This helps with restoring one’s identity as a normal human being rather than being shattered and nothing. Then one might experience a feeling pride in Self, a feeling of fierceness, a desire to defend Self. This is the sense of Self-defense and Self-esteem coming online. Once Self is found, it is easier to feel the desire to protect and defend it, and to feel proud of it. If one has no access to Self, concepts such as self-esteem and self-defense can be confusing. They may make sense intellectually but not experientially. It’s not that one does not care about these concepts, one may care a lot about them; it’s just that they make no sense without an embodied experience of Self. One may begin to gain a sense of having emotional boundaries, the sense of what is OK and what is not OK to experience emotionally and in relationships. This boundary awareness could have been completely lost or misplaced as a result of the traumatic experiences. Accessing Self would also allow access to the inner knowing of what one wants some refer to as “My Truth” or “My Personal Truth” as well as one’s Personal Will, the “decider” or action-taker. The ideas of Personal Truth and Personal Will probably are difficult for someone who has no access to Self to really truly “get.” Once that connection to Self is re-established, feelings will begin to arise from Self – the feeling of dislike for something, or of liking something. These feelings develop complexity, maturity and expression and eventually become “My Truth” about a situation. Access to the Will also may come back online and one can act on their Truth which eventually turns into the development of authenticity. There is a baffling passivity that comes with having no access to Self and being stuck in states of Immobility (deer in headlights) Dissociation (mind is in another time/place) and Hyperaraousal (uncontrollable terror). Of course, as the agent of life (Self and Will) has been totally obfuscated and lost, passivity would be expected. These exercises help gently bring one out of this extreme passivity. 1. Fear-Soothing Self-Holding Exercise. Place one hand at the back of the neck right at the base of the skull, place the other over the solar plexus (right under the rib cage). 2. Lower Body Inclusion. This is for the more flexible: Lay on your side and place one hand on your heart and the other at the base of the spine/tail bone. 3. Mental Container / Mental Calm Exercise. Place your hands on each side of your head, so they are holding and soothing each hemisphere of the brain. Then place one head on your forehead and one hand on the back of your head. Feel how your hands create a container for your thoughts. 4. Patting Exercise. In the same video, Peter Levine also introduces the patting exercise. Pat yourself all over, to point out to yourself where your edges are. Sense into the feeling of having edges, the place where you end and the rest of the world begins. Byron Katie invites you to this walk, here with your eyes closed, or as you walk in the world. It's a silent meditation. It's about noticing. "It's so lovely to just walk and not know," Katie says, "and let the world tell you what it is rather than you telling each object. Just listen, be still, and let everything name itself, or not. Just notice and be free in that, as though nothing has ever been named. Someone called it "tree," and you really think it's a tree. But what if you just got still, noticed, and let it tell you? I invite you to that don't-know mind in your morning walk." In this exercise, you create your own version of a perfect, well-­­celebrated welcome of yourself as a unique being with very special contributions to make to the world. 1) Design your birth, make an internal movie/draw where you wold like to be born ect. 2) Your tribe - who do you want to be there, at your birth - allow them to show up at your birth. Make eyecontact to each person and say hallo and let them introduce them selves to you. Take time to let them see you. Feel and take in the relational field. 3) Having people there who can see your sepcial talent, contribution ect. that you can bring in to the world. Notesing what happens in you. This Welcome to the World Corrective Experience helps you regain the sense of your existence being celebrated. In this exercise, you imagine someone lighting up when they open their door and see you. You take that image and feel “into” your eyes and allow your eyes to reach out to that joy you see in the other person’s eyes. This exercise accesses the original attachment gaze and gives it support, and perhaps emotional limbic nourishment as well, and exposes the original wound. We work with the attachment gaze to give it time to heal, discharge emotion, overarousal and the original distress. Take a moment to see if you can see that, take it in, and bring it back into your body, back into your eye, while you are maintaining an awareness of how it’s affecting you. It might be one person, it might be more animals and people anything that helps you connect to that loving kindness and passionate, caring presence that you can see in the eyes. Try to accepct all the feelings, that this exercise brings up in you. aha, i had learned this as i am sharing in the hunger thread. thank you anne12, i had seen this before but didn't realize it was relevant to me. it's such a process to go through the layers of awareness and fine-tune this! i mean the part about it's not always best to sit still and meditate! Watch out if you are used to do meditation. Who is watching the observer ? When fine tuning into an object, you can not see/feel yourself and your body. John J. Prendergast, Ph.D., the author of In Touch: How to Tune in to the Inner Guidance of Your Body and Trust Yourself, is a recently retired professor of psychology at CIIS, psychotherapist, and spiritual teacher. a lot of mynneditation is present moment mindfulness of emotion, or body awareness moving though the day to remain present. it's been extremely good for me but in deactivation is the wrong approach.